Then I remembered that all rich people are friends now and we have no real courtside beeves. 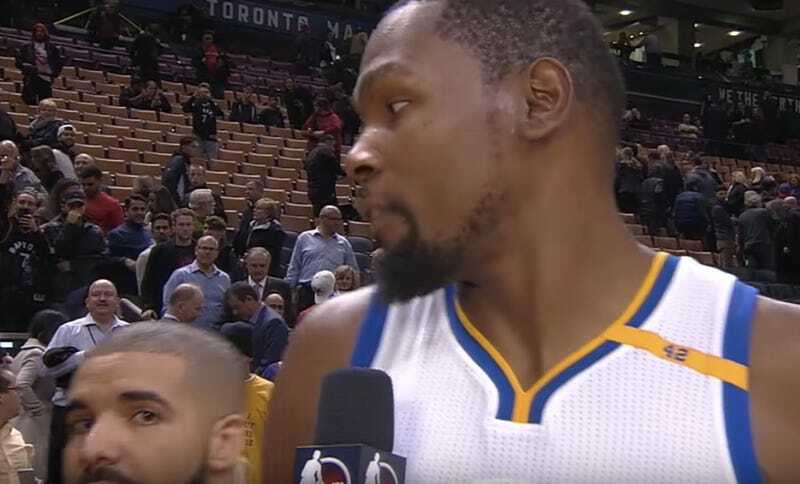 By the time he gets to “I don’t give a damn about no Drake Night,” the half-smiling Durant can’t even sustain kayfabe. KD evidently didn’t give a damn, though, since he roasted his friend’s team for 30 points, nine rebounds, and six assists. Did you realize he was still averaging 27.7 points per game in his crowded new home? And on 56.2 percent shooting? I sure didn’t, and yet I am somehow already bored by these facts.